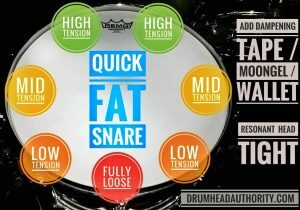 DrumheadAuthority has just released a huge new article on fat snare drum tuning methods. There’s an overview of some of the traditional and not-so-traditional ways to get a deep, punchy, fat snare sound. Listen to samples of some of the different tuning methods, and check out some of the best products out there. We’ve also covered some of the best cheap (and even free) ways to get this sound, and some bonus tips to make sure your snare drum sounds as good as it possibly can. Check out our fat snare drum tuning article here! Previous PostPrevious Happy 100th Birthday Buddy Rich!